So what does this have to do with a BALLPOINT Nighthawk? Well, I was poking around on the Anderson Pens site one evening and noticed that not only do they have some of the remaining fountain pens, but they also offer a Nighthawk ballpoint. Because I already own the fountain pen, it just made sense to pick up one of the ballpoints, because that pen, too, is wonderfully stealthy, and I assume, in limited supply. The Nighthawk ballpoint takes my favorite Parker-style refill— the Schmidt EasyFlow 9000— which lays down a lusciously rich jet black line that’s smooth and thick. The blue refill is just as nice as the black one, assuming that you’re okay with lines that are on the broad side. The ballpoint weighs 44 grams, so it’s no lightweight. I use it throughout my work day jotting my to-do lists in a Field Notes notebook so I don’t experience hand fatigue from writing with such a heavy pen. Longer writing sessions could, I suppose, get a little tiring, given the heft of the Nighthawk. The pens “innards” are sturdy metal (brass?) which explains why the pen feels so solid and substantial. 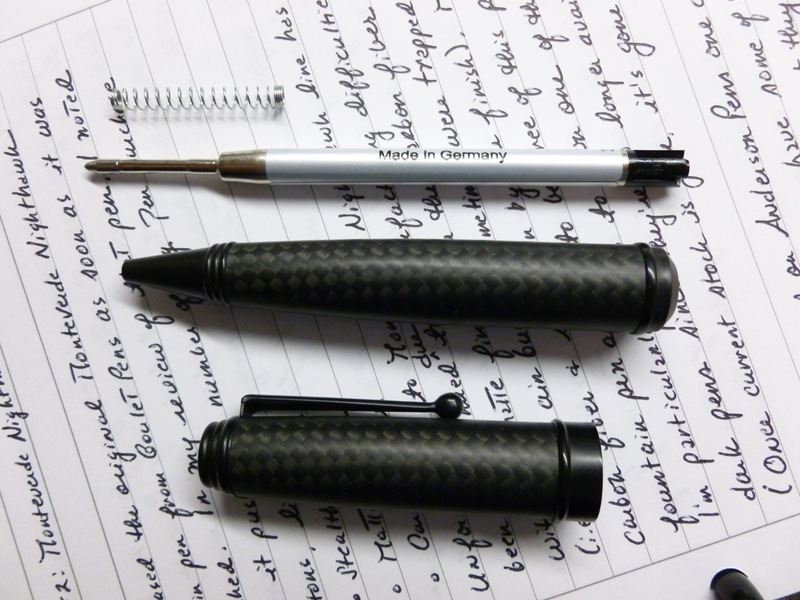 The refill is deployed by twisting the upper or lower half of the pen’s carbon fiber body. This mechanism works silently and smoothly. 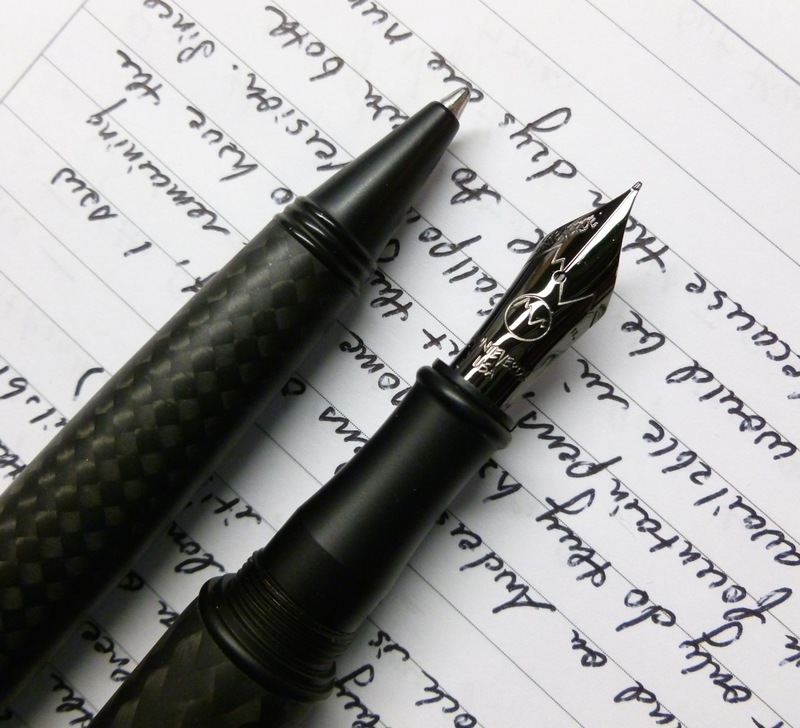 In looks, the ballpoint is a “fraternal twin” to my fountain pen version, which means that there are a few differences aside from the fact that one’s a fountain pen and the other is a ballpoint. 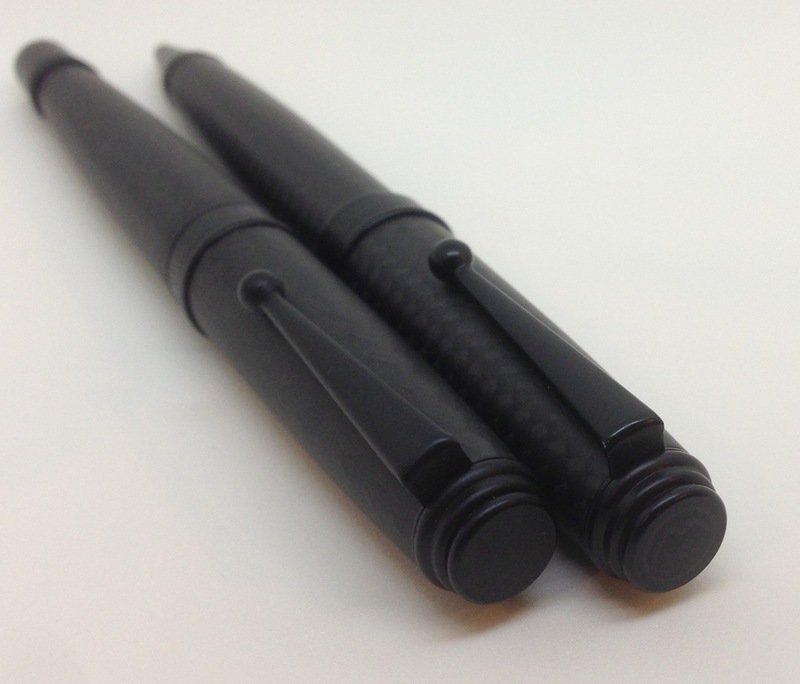 There were two slightly different versions of the Nighthawk fountain pen. I have the original version with a bigger carbon fiber weave and very minimal branding. The ballpoint more closely resembles version 2.0 of the fountain pen with a tighter carbon fiber weave, and just a touch more branding. My ballpoint features a very subtle rendering of the Monteverde logo on the clip end of the pen. 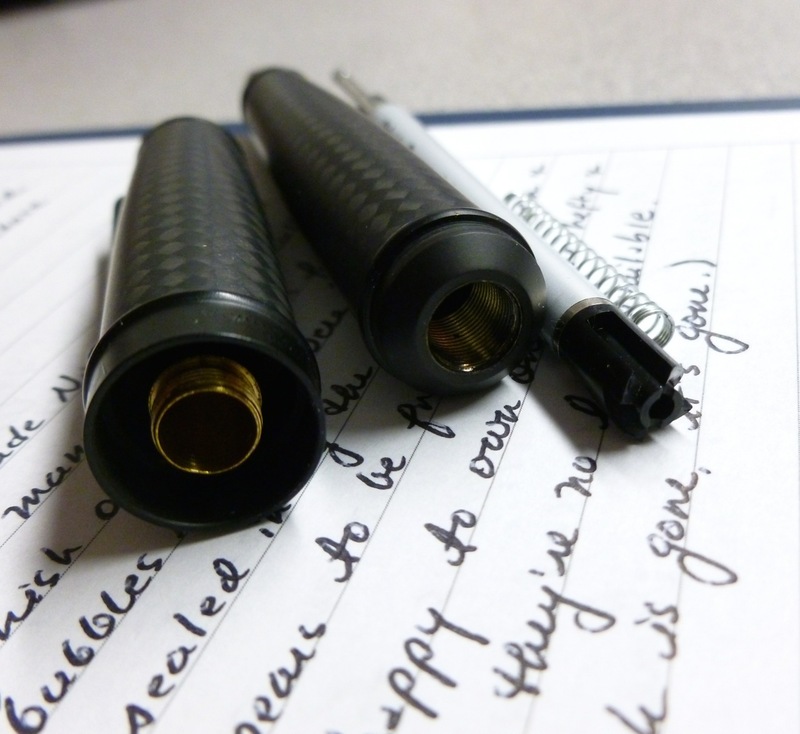 This small detail was not included on the original version of the fountain pen to keep the pen super-stealthy. A little bit of research revealed that there is an actual bird called the Nighthawk. It’s not black, but is well-camouflaged and stealthy. It’s considered a common bird but is declining in numbers. The Nighthawk— the bird AND the pens— once they’re gone, they’re gone. That seems like a real shame.